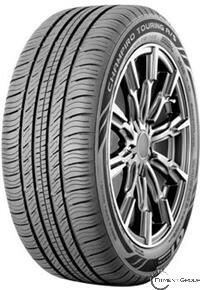 Champiro Touring A/S is an all-season touring tire designed for the latest passenger cars and crossover vehicles. It combines precise handling and control with a quiet and comfortable ride. Backed by a 60,000 mile limited warranty, the new Champiro Touring A/S also delivers great mileage for an outstanding value. Four wide circumferential grooves ensure water drainage and improved wet performance. Full-depth sipes improve grip and provide biting edges for all-season performance. Large shoulder blocks increase tread pattern stiffness for improved handling and cornering. Optimized variable pitch tread blocks reduce tread pattern noise for a quieter ride. Rim protector helps protect the wheel from curb damage.